As the spring and summer months approach, many homeowners start to spend more time outdoors in their gardens and patios. 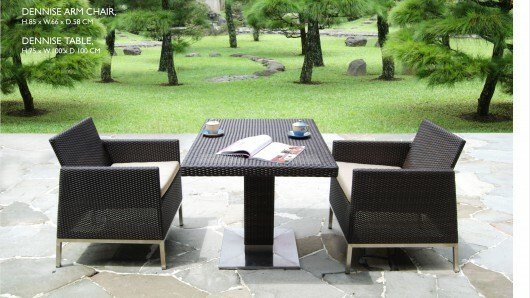 Therefore having some garden furniture to decorate your outdoor areas is a must. However it is important to ensure that the garden furniture is not only beautiful but also durable. After all it is going to be subjected to diverse weather conditions, and you want to ensure that you get value for money. Thus you need to choose your garden furniture wisely. Garden teak furniture is among the best choices you could possibly make. Wisanka offers a vast range of teak outdoor furniture that will make your garden or patio look more aesthetically pleasing, and at the same time we guarantee that teak is one of the most durable and long lasting materials you could possibly opt for. Wisanka has been operating in the outdoor furniture market for many years and we have thus come to understand the diverse client needs and preferences. We thus offer a very diversified range of teak wood furniture, including teak garden tables, chairs, and benches. We also have a very nice range of teak bar furniture. Wisanka also offers a teak garden furniture custom design service for those who gave very specific preferences in mind. So for all your outdoor patio furniture, you need look no further! Wisanka has it all at the best prices on the market!